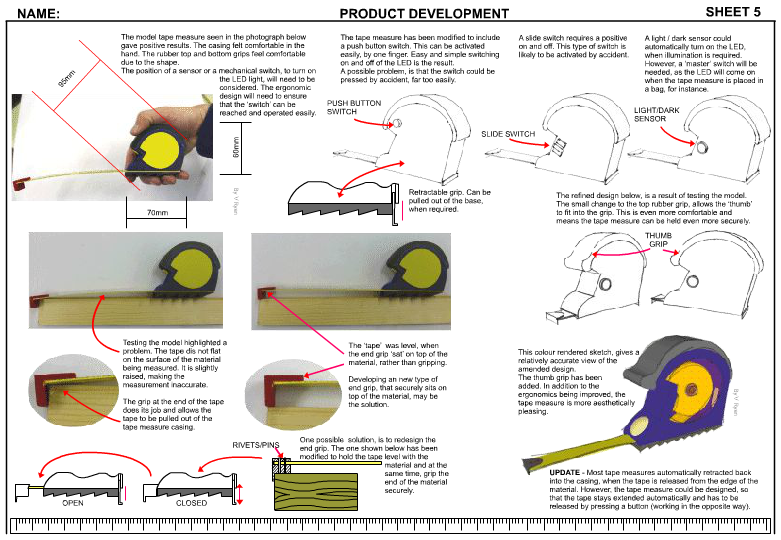 This design sheet shows the further development of the tape measure, through testing one of the models. This shows how useful a model can be, in identifying additional design problems and working towards solutions (read the sheet below). A design sheet involving models should show how they have been tested. Developing the design has led to possible solutions, including using a a variety of switches to turn the LED on and off. A thumb grip has been added, to enhance the ergonomic design of the casing. Also, a new design for the end grip has been introduced, so that the measuring tape is parallel, with the material being measured, giving a more accurate final measurement.